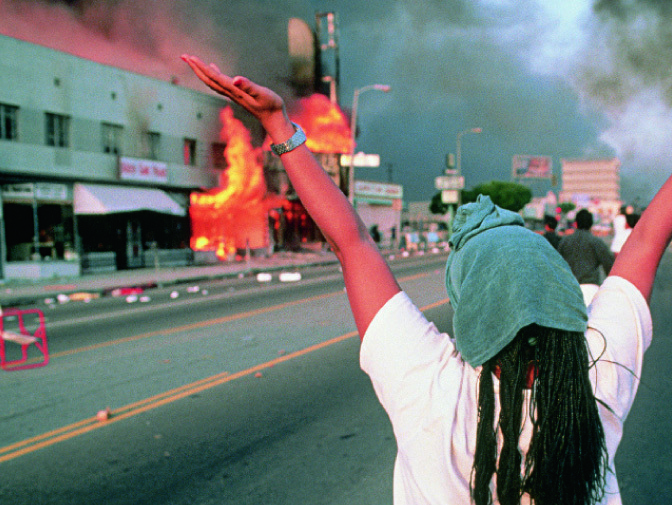 (ARISE magazine: issue 12) A home video that captured Rodney King being beaten viciously by white police officers shook Los Angeles – and the world – in 1991. It exposed the racism and prejudice still engrained in America decades after the Civil Rights Movement. Twenty years on, the raw brutality of the grainy, black-and-white footage is as powerful and shocking as ever. and prejudice were rife. It was in this setting that Rodney King was caught speeding as he drove home with two friends on March 3 – triggering events that would change the course of his life and his country’s history. King was no angel. On parole from a prison sentence for robbery, under the influence of drink and fearing arrest, he refused to pull over. Instead he led the California Highway Patrol on a high-speed car chase, pushing the car to over 100mph. When he was finally caught, he was surrounded by LAPD squad cars and ordered out of his vehicle. The four accused officers later claimed that King was aggressive and tried to resist arrest. So, they said, they restrained him, first with two Taser stun-gun shots and then with blows from their batons – all supposedly in self-defence. That might have been the end of the story had it not been for local resident George Holliday, who video-taped the incident from his balcony. The story that his amateur video showed was very different from the one told by police. Far from acting in self-defence, at least two of the officers repeatedly beat King with their batons and kicked him as he lay on the ground, almost motionless, while several other officers looked on. The pounding lasted more than a minute and a half. When it finally ended, King had fractured bones in his face and leg, deep cuts and heavy bruising. Holliday took the video to TV networks and its subsequent broadcast caused public outrage across LA, the USA and beyond. The officers were charged with using excessive force and appeared in court the following year. In the face of the video evidence, their self-defence claim seemed incredible, yet even more incredibly, it worked for them. On April 29 1992, an all-white jury acquitted all four. The response, particularly in the predominantly black neighbourhoods of south-central LA, was instant and furious. For communities that had been at the receiving end of police profiling, racial prejudice and harassment for years, the verdict was the final straw. In the four days of rioting that followed, cars were set alight, retribution attacks were carried out on white and Asian people, and National Guard troops were sent in. In total, 53 people died, more than 2,000 were injured and at least 7,000 were arrested; the cost of damage caused to property came in at around US$1bn. Horrified, King made a public appeal on TV calling for peace and promising “we will have our day in court”. His desperate entreaty, “can we all get along”, became famous, and the riots soon came to an end. for domestic violence and drunk-driving, spent time in prison and had another close shave with death after he was shot while riding on his bicycle. He has returned to the public eye with bizarre appearances on reality show Celebrity Rehab with Dr Drew, a televised boxing match with a former police officer, and his recent engagement to Cynthia Kelley, one of the jurors in his civil case against LA City. Nevertheless, as long as King’s name remains synonymous with police brutality, his story will continue to serve as an important reminder of a dark period in recent American history.